Glued underlay has slots running throughout it so that glue can be placed in the slots and your flooring can then be fixed on top. 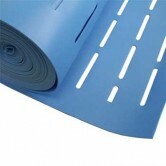 This type of underlay can be used with solid wood flooring, engineered wood flooring and laminate flooring. The underlay still acts as a cushion between the subfloor and your flooring choice, and it can offer thermal resistance and sound proofing. The advantage is that you can achieve a maximum bond between the floor and the subfloor so it allows you to use solid wood flooring or engineered wood flooring as you can fix it into position rather than floating it. 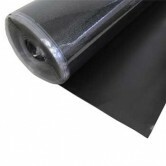 Glued underlay is the only type of underlay that can be used with solid wood flooring and engineered wood flooring. Solid wood flooring is not a dimensionally stable product so needs fixing down to the subfloor to give it stability and strength. 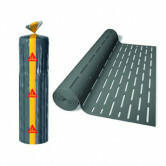 Glued underlay will allow you to fix the flooring to the subfloor by placing glue in the slots of the underlay. For a quick guide to underlay, see our blog article, What underlay should I use for my wood floor?